Room to Read, a non-profit organization that donates libraries to communities in developing nations, is the inspiration and life-work of former Microsoft executive John Wood, who delivered the keynote address at the Public Library Association Conference in Minneapolis, MN on March 25, 2008. I was fortunate enough to be in attendance as Mr. Wood brought his energy, intellect, humor and passion to an audience of over 2,000 librarians. In addition to donating libraries, Room to Read also builds schools, publishes children’s books in the native languages of developing countries and provides scholarships to girls in nations where they would not normally have the chance to receive an education due to lack of funds and cultural preferences. Founded on the belief that “World Change Starts with Educated Children” – and that education is the key to breaking the cycle of poverty, Room to Read has established over 5,100 libraries in the developing world since its inception in 2000. 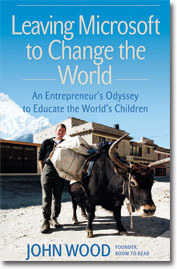 Mr. Wood was inspired to leave his job at Microsoft after a vacation spent trekking in Nepal where he had the opportunity to visit a local school whose library’s only books were popular soft-cover fiction titles in English left behind by other hikers. His promise to return with more appropriate books for the schools’ students, was met with a certain degree of skepticism, as the local teachers had heard this many times before; but return he did, with Yak-loads of books. The joy he saw on the faces of the students as they eagerly accepted his donation convinced Mr. Wood to quit his job at Microsoft and found an organization that could address this problem on a larger level. His transformation from Microsoft Executive to proselytizer-and-chief of a pioneering non-profit organization is documented in Mr. Wood’s memoir Leaving Microsoft to Change the World. I picked up a copy at the conference, and found it informative, inspiring, and surprisingly entertaining. As I write this JJML has ordered a copy, which should be on our shelves in a short time. Had I known about this book when I was compiling my Staff Picks list for April, it would definitely would have been on the list. I recommend both the book and the charity as worthy of your time and money. You can find out more about Room to Read at http://www.roomtoread.org.